Farm life and battling adversity are almost synonymous, and a strong part of our nation’s history and psyche. We’ve had our fair share of setbacks and a steep learning curve at our beloved Atherton Farm, but I’d never class us with the likes of the broad acre farmers who are at the mercy of the weather. We’ve had the odd tragedy or three, but nothing that could break us. However, at the end of November we faced true adversity and we almost lost everything for which we’ve worked so hard. The last couple of weeks of November had some hot and windy days. There was one day in mid-November where local schools closed pre-emptively. I didn’t understand it at the time, as it wasn’t a particularly hot day, though it was very windy. I figured it’d have to be a hot day to be a real risk. We learned just how wrong that is. Just as an aside, our bushfire preparedness plan was almost non-existent. It’s not because we hadn’t thought about it, but rather because we were advised by locals that we just didn’t need one. The land around us is flat and used exclusively for broad-acre farming. In the event of a fire, and we have had them close by before, every cocky around us rocks up with their own fire-fighting units to battle the blaze. The CFS is also very responsive, and between them they control most fires in fairly short order. We did get our own little fire-fighting unit, and the advice we received was to use that on our place to fight any spot fires should anything get close. I was at work on Wednesday, November 25th. I was coming back from lunch with some workmates when we saw a huge amount of smoke to the north. We’d heard that there was a fire locally to work, and assumed that was the source of the smoke. As it turns out, that smoke was from a fire that started at Pinery. Pinery is just to the south and west of Owen, and about a half-hour drive from where we live, and a full hour from work. It’s somewhere between 30 and 40 kilometres from home in a straight line, which is really a long way when you’re considering a bushfire. 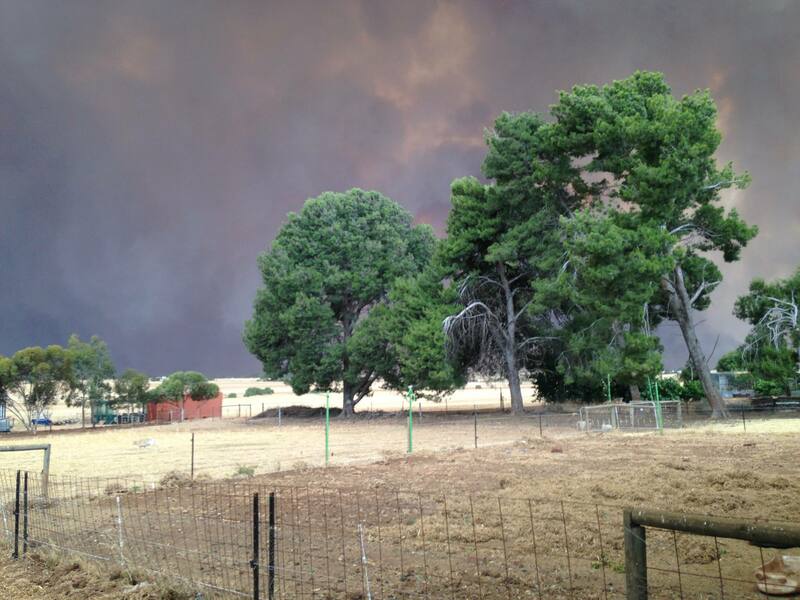 Especially a bushfire that is burning mostly in open paddocks without a lot of actual bush. Linhda called me at work an hour or so after lunch, and said that the fire was closing on Templers where we live, and that the authorities had started to close roads. She advised that I come home to avoid the road closures. At the time there was no real sense that I’d have to go home to fight a fire, but more to avoid the inconvenience of closed roads. That fire that was local to work, the one we’d mistakenly though had produced that massive pall of smoke, ended up burning all of 5 acres, but was enough to close the freeway I take to get home. It took some innovative navigation to make it the 10km from work required to get past the blockades, and as a result I ended up taking maybe an hour to get home rather than the normal 30 minutes. I was about halfway through that when Peyton called to say that she and Linhda had evacuated with the cats and dogs. I honestly thought they were over-reacting. 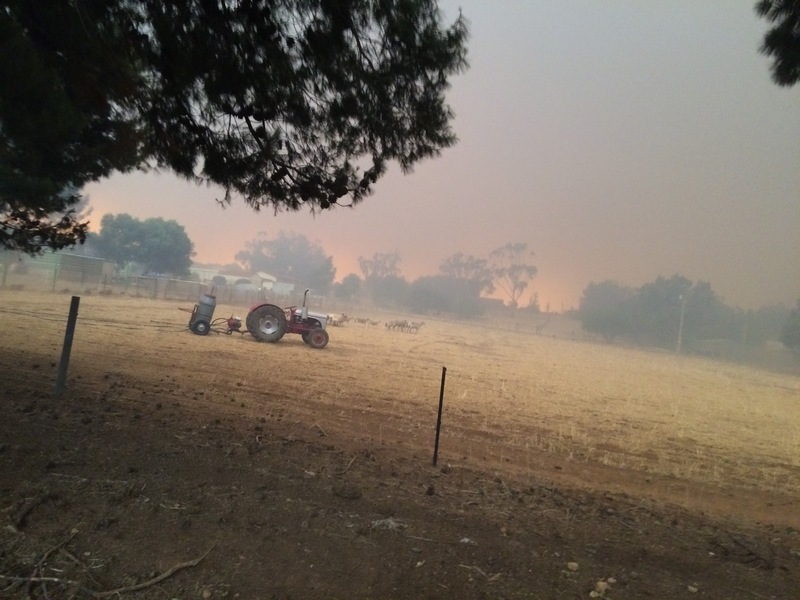 There was nothing around us to burn – all of the crops had been harvested, and the paddock next to us had grown lupins which meant that it looked like almost bare earth after the harvest. However, I figured it made sense for them to evacuate if it made them feel better, and the cats and dogs wouldn’t be so stressed due to smoke or sirens. I remember two things just after Peyton called me. Firstly, the wind was incredible. I’ve never seen or felt anything like it. Secondly, I watched the water bombers taking off from the glider club at Gawler, which is right next to the freeway. They were taking off into the wind, and it looked like they were barely crawling. That, against the backdrop of giant clouds of smoke, was surreally terrifying. 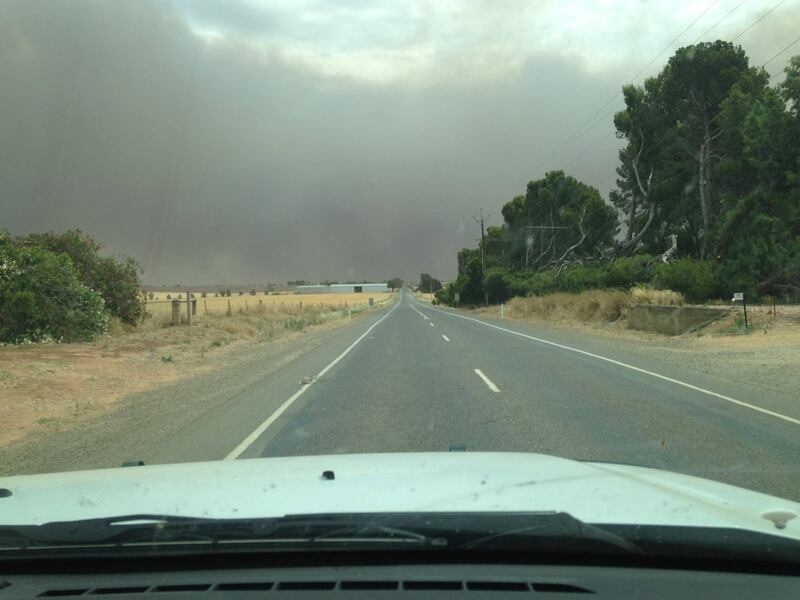 I realised how serious it all was as I was getting close to Roseworthy, which is about 5 minutes to the South of home. 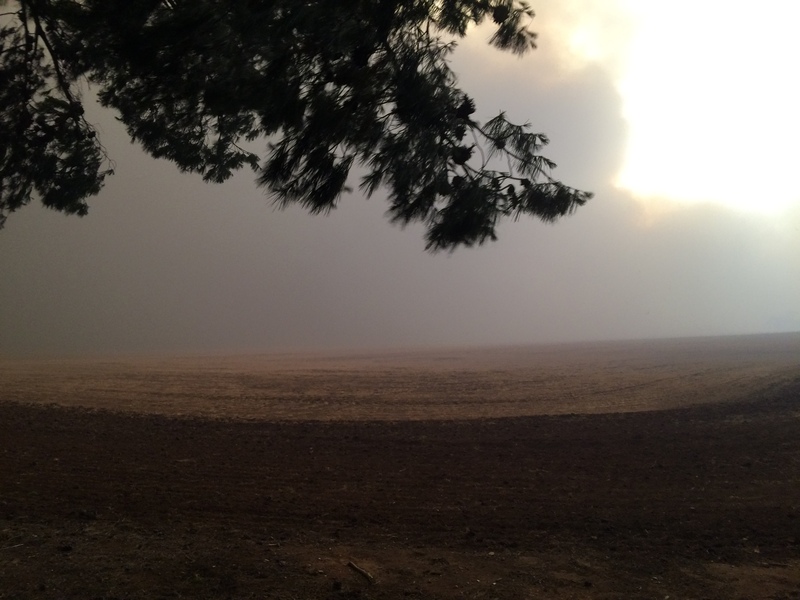 The smoke was incredible and Roseworthy was completely engulfed in it. 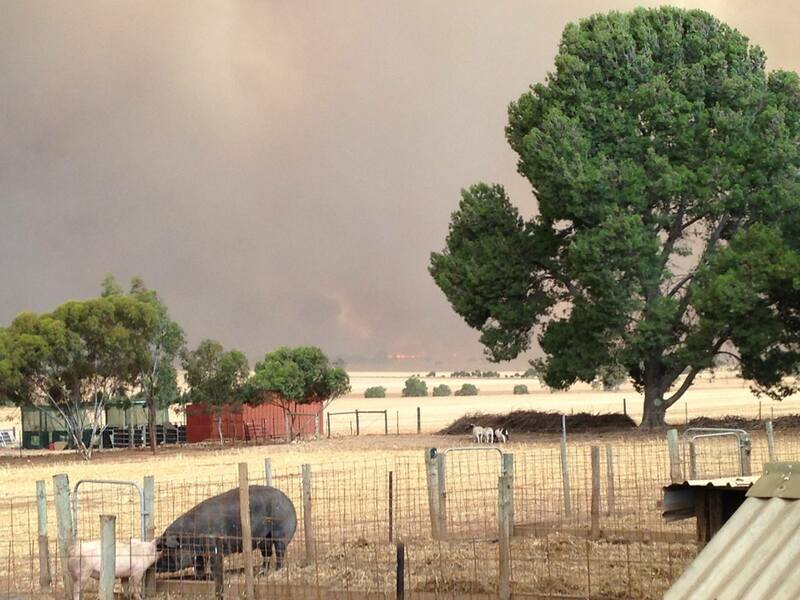 The wind was out of the North West and the fire was past Wasleys, which is about 5 minutes to the West of home. 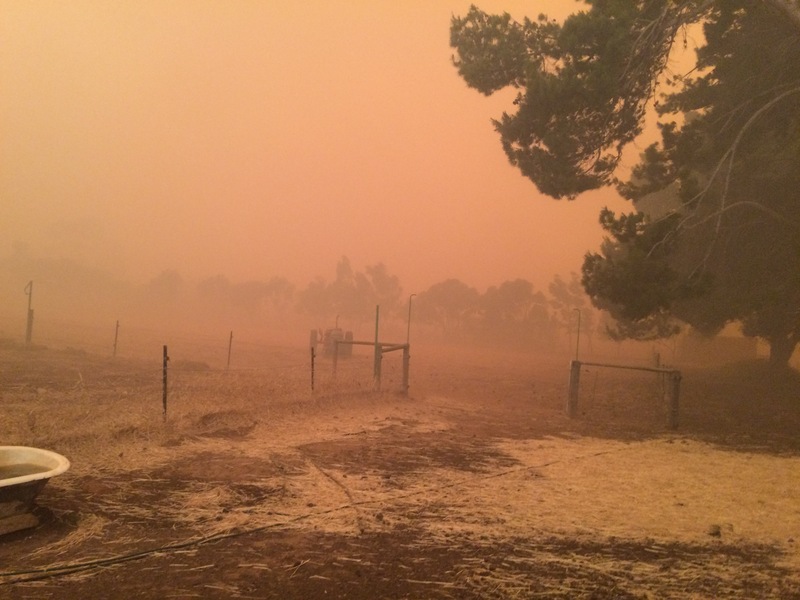 It was dark as midnight in Roseworthy, and it was like a scene from hell. I was lucky to get through there just before they closed the highway. 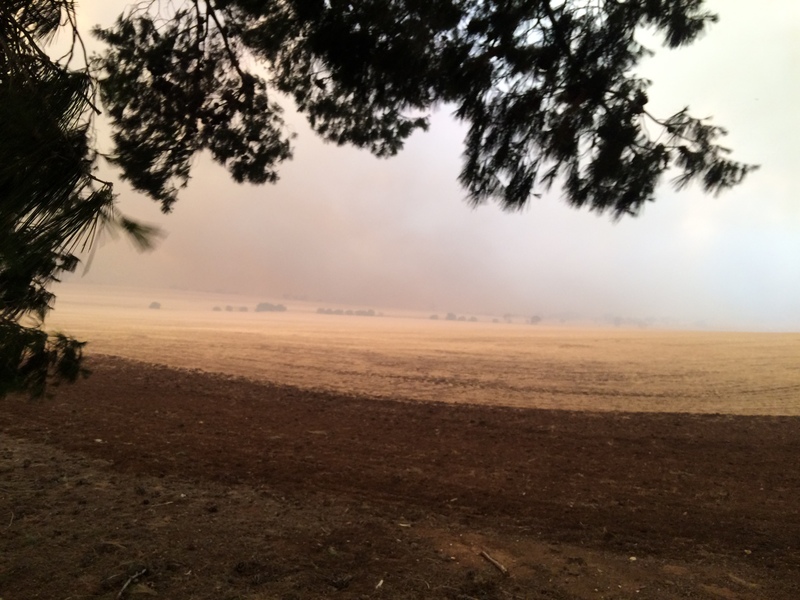 Just north of Roseworthy I actually spotted flames for the first time. 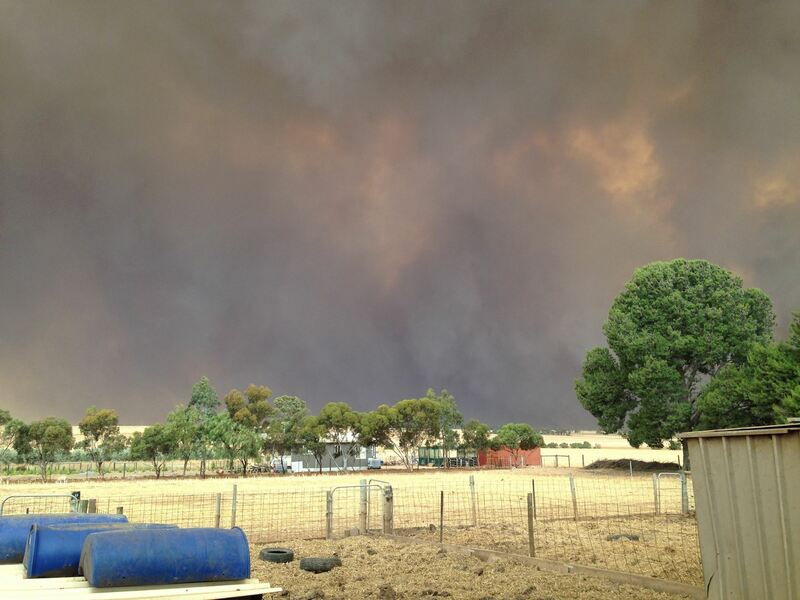 To the West, which was to my left, I could see across paddocks for a kilometre or two, and it was a wall of flames. There was nobody in front of it. There was nobody fighting it. It was in front of every effort to contain it. Dad took a heap of pictures just before that time from home that give some indication of what was happening. At that time, you couldn’t see flames from our house. 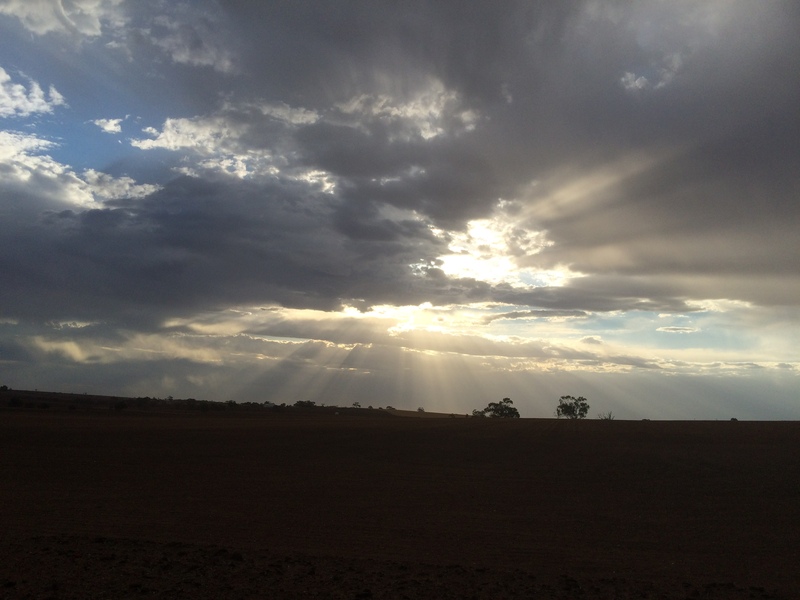 Dad was driving back from the abattoir to home – this is him heading West out of Freeling towards our place. This is the pall of smoke from Wasleys. They lost buildings in the main street. This is apparently as Linhda and Peyton were packing to leave. I was leaving work right about now. Looking South and West across our back paddock. 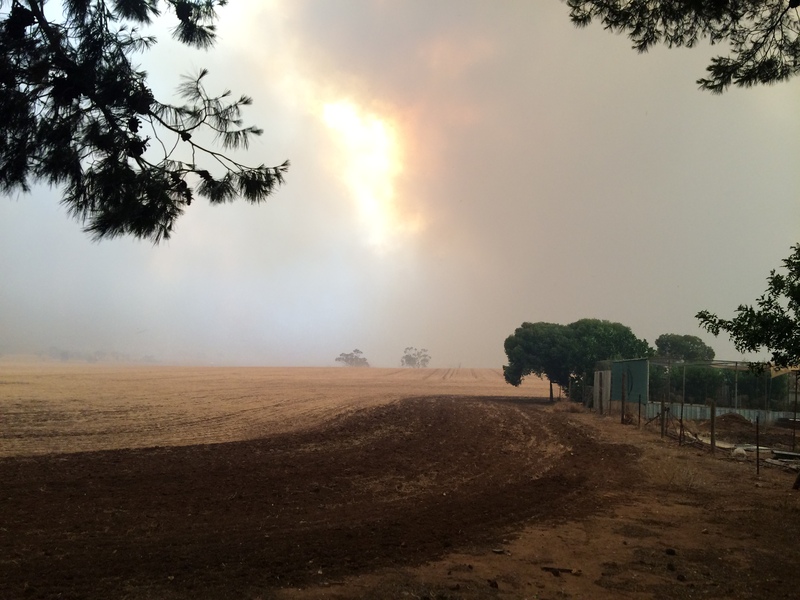 Looking South and West across our back paddock – there’s another picture later that shows a similar vantage but you can see the flames. Pigs happily ignorant of what was coming. I got home around 2:30 I think, though it may have been closer to 3. 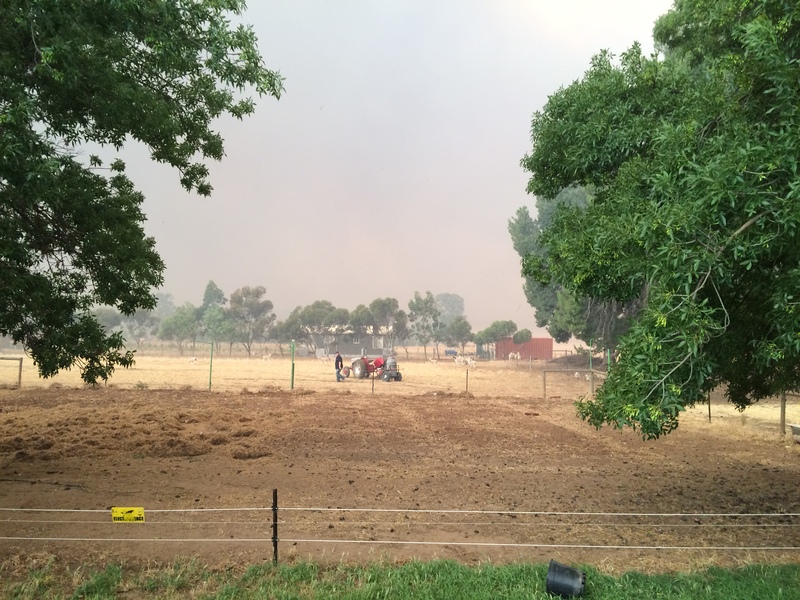 Dad had organised the tractor and our little firefighting unit, and positioned them down the back of our place – in the South-Western corner. We have a line of tall pine trees and that was where any fire would hit us first. We figured that would be the best place to stop anything coming our way. As it turns out, that logic was spot-on, but the thought of us stopping that fire were completely naïve. Getting the tractor and firefighting unit situated. Ironically, we used the firefighting unit to put out the tractor, and then the firehose burned so I had to use a wet towel. Even at that time, even with the smoke and the very clear dangers, we were fairly confident that we were fine. The wind was strong but was blowing to the South and East. We started to see flames on a ridge that is somewhere around one or two kilometres from us to the West, but they were pushing past us. We could see giant gum trees silhouetted along that ridge line, and there were fire tornadoes that were at least twice the height of those trees. That was all terrifying and mesmerising, and the result is that we took very few pictures. We did get a couple of the fire as we first spotted it though. There’s a group of pictures earlier from nearly the same vantage that show the smoke. This one is shortly after I got home, and is when the flames first showed. Dad and I stood there and watched them for maybe 10 or 15 minutes when we felt the wind change direction. It started to blow directly into our faces out of the West. The result is the fire we had been watching stream past us became the front and it changed direction to come directly towards us. It took somewhere between one and two minutes to get to us. This is just before the wind changed direction…. … at this point the wind was mostly out of the North West, and so blowing South and East. It was pushing the fire past us. At this point the wind changed direction, and the Eastern edge became the front. The smoke and dust quickly built up and was on us in a minute or two. This is after the initial firestorm had been through, just before the bulk of the flames hit us. I just had time to get from the tree I’d hidden behind to dad who was in our cow shed. One thing we’d not noticed until afterwards is that the fire went around us. 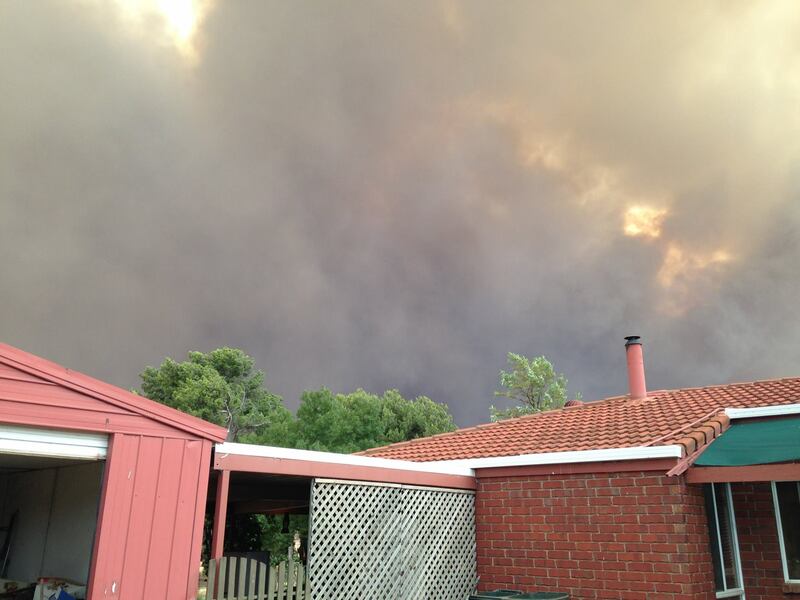 I have a picture facing East that clearly shows fire burning towards Freeling before the fire actually hit us – we are between Wasleys, where the fire came from, and Freeling. It was just before, a matter of a few minutes, but it was definitely over the highway East of us before it started to burn our place. This is pointing East, just before the firestorm hit us from the West. The fire was around us at this point, and was already burning towards Freeling. I’ve never been in a bushfire before, though I’ve been close to them. I’ve never been on the ground experiencing them though, and you can’t understand what it’s like until you’ve felt it. The wind was strong to start with, almost strong enough to make you stagger. Ahead of the fire though, right before the firestorm hit us, the wind would’ve taken you off your feet. Dad was in the cow shed, and I hid behind a big pine tree maybe 10 seconds before it got to me. It blew around me like nothing I’ve ever felt – rushing wind and smoke and dust, all of it red and black and burning. A CFS firefighter explained to me what that firestorm was, either that night or the following day. 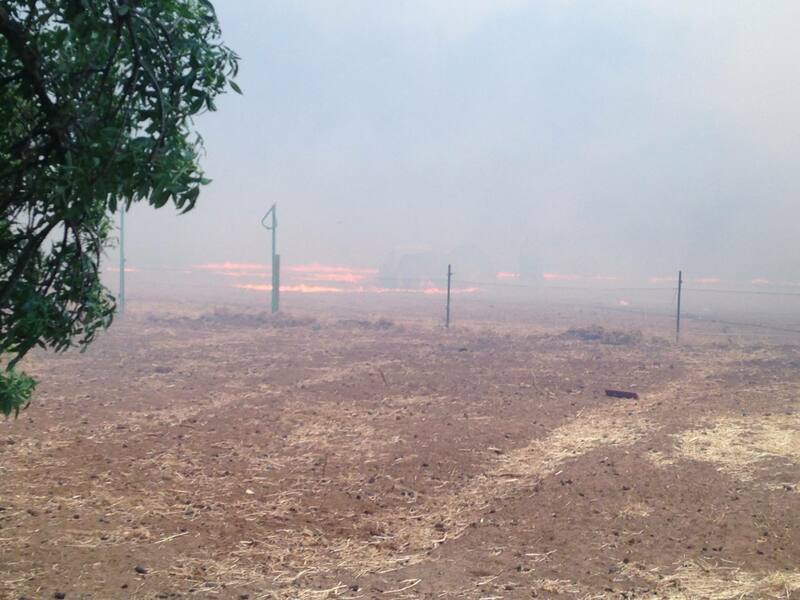 I’d said to him that it made no sense that a paddock with next-to-no stubble on it could sustain a fire that furious. He said that the firestorm rolls across the country side, pushed by that giant wind, and it picks up every combustible thing in front it. It basically brings its own fuel with it, until it hits a fuel load, which it then ignites. That’s exactly what we saw as it hit our place. These flames extend from the fence line out maybe 20 to 25 metres. This picture was taken a fraction of a second later, and you see how far the flame has already started to burn into our paddock. 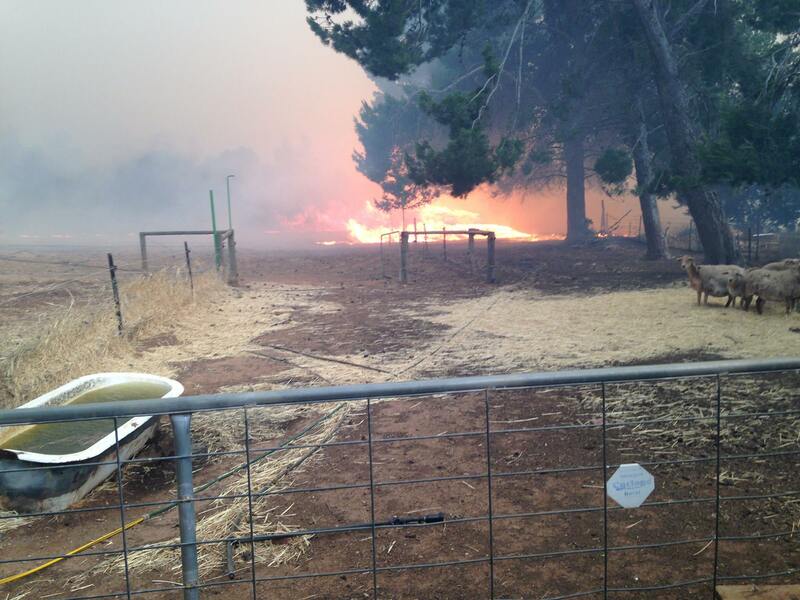 The back paddock burning, along with Sheldon. This is after the pigs had been let out, and Ziggy and Stumpy were gone. I tried to put out those sheds for hours, but they ended up burning down to almost nothing. I never thought our place would burn. Maybe the stubble in our paddock, but nothing else. The fence posts would need a load of fuel near them to get started. The pig sheds would need even more than that, as they were made out of large, smooth, planed sleepers. Hell, I could’ve held a blow-torch against them and they’d not have started to burn. 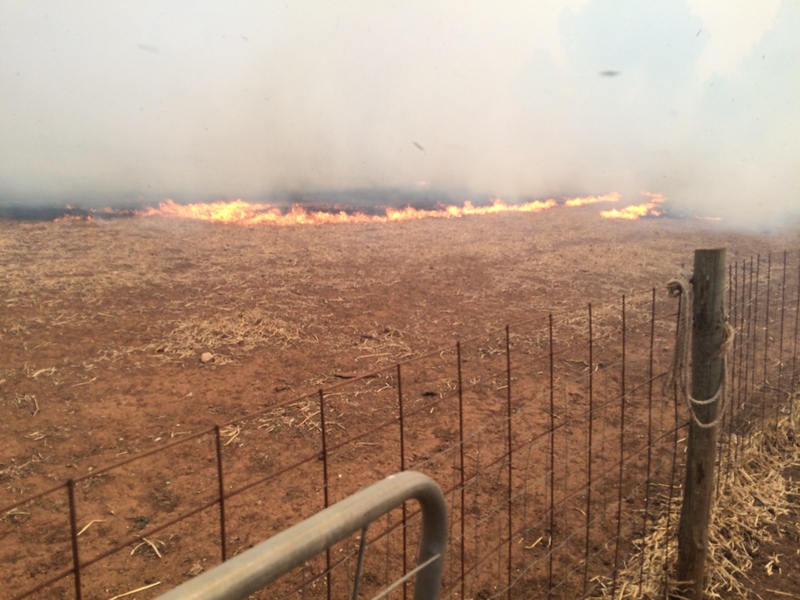 As the actual flames hit us, I thought it would blow through, burn up the stubble, and continue on its way. I was so very, very wrong. Dad and I started to run around and do what we could. 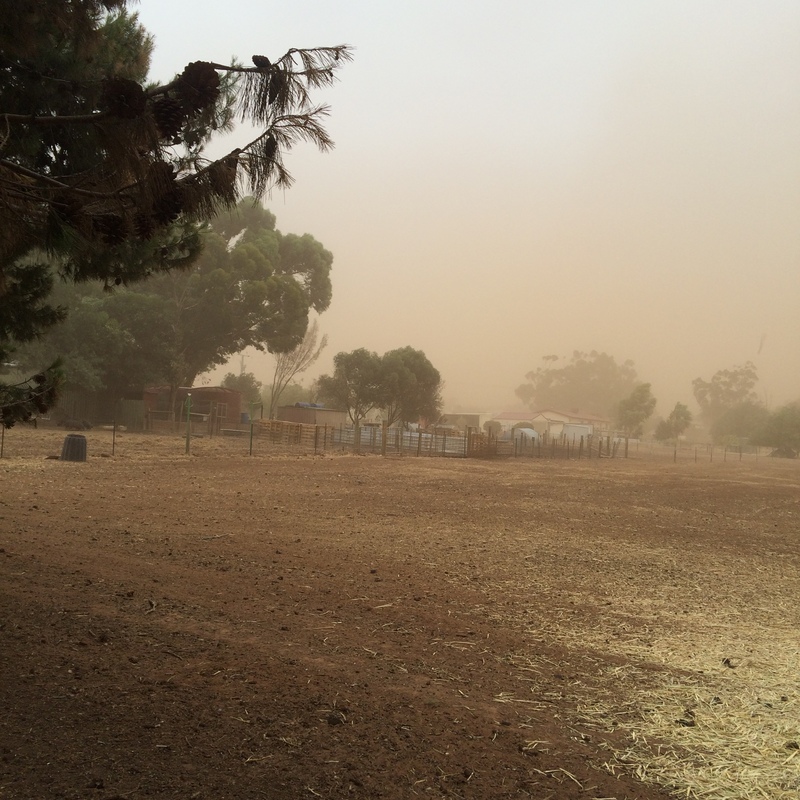 We quickly found that smoke and blown dust made most things impossible. I ended up putting on safety goggles and wrapped a wet rag around my face, which let me get around pretty well. We then spent an hour or two running back and forth reacting to whatever problem we could see. We moved our sheep into a side yard that was protected from the fire. When our neighbour’s house started to burn, we were able to move the sheep back on to the burned ground. I saw Farmer John’s house start to burn. In fact, I heard it as the fire started in his pergola. 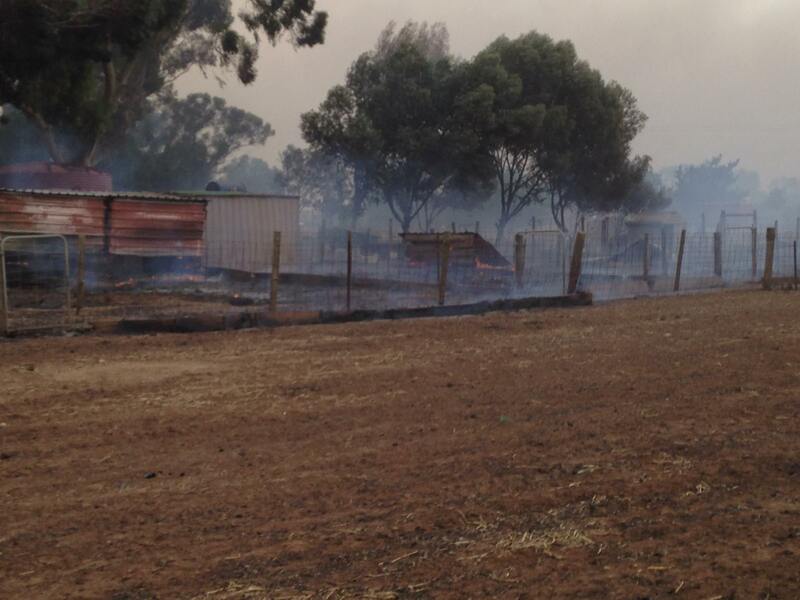 There was a CFS unit at the place behind us, and I got to them across our burned paddock in only a minute or two. They maybe took that long to get to the house, but by then they assessed it as too far gone. It took most of the night to burn down to almost nothing. I remember sitting on my roof with a hose, trying to keep embers from John’s house from burning my house, and trying not to cry. 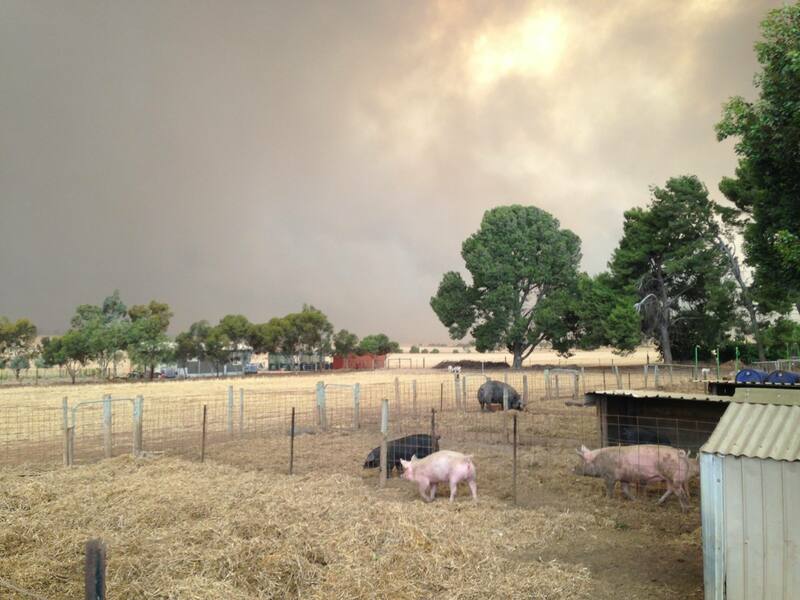 I was sure the pigs would be okay, as their shelters seemed relatively fire proof. Yes, much of their structure was wood, but I couldn’t see embers, or even their bedding, setting that alight. Again, I was wrong. 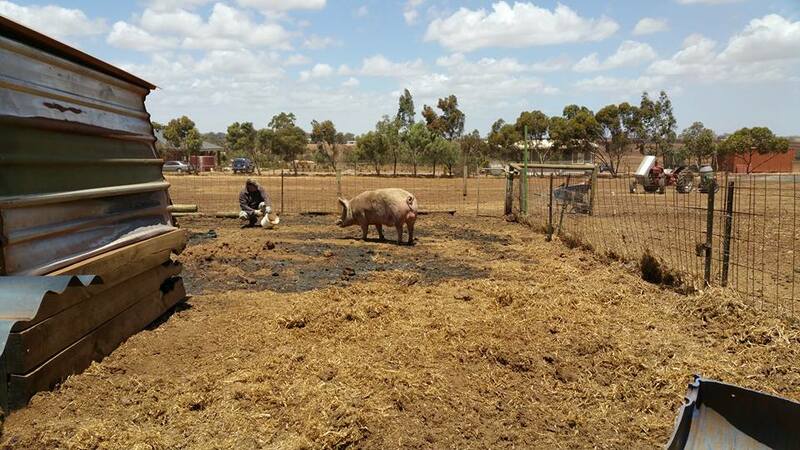 We’d just had an MFS unit leave our place when the pig runs started to burn in earnest. I opened the gates and got most of them into the front paddock near the house. We had two girls in with Boris though – Ziggy and Stumpy. Ziggy was hands-down my favourite, as she had the best nature and was so much fun. Stumpy had been positively pregnancy tested the day before. It would have been her third litter, and she was a great mum. I couldn’t let them out the front with the rest because of Boris. He’s a good boy, but with the smoke, fire, and noise, I couldn’t let him out where all of the firefighters were. He may be good, but in a panic he could do some real damage to somebody. I was sure they’d be okay in their run though. I had just gotten the rest of the pigs sorted out when I heard Ziggy and Stumpy screaming. Their shed was fully ablaze. I raced down there as fast as I could, but I couldn’t even get close to the gate because of the heat. I saw one of them, Ziggy I think, rearing up in front of the shed, burning and screaming. There was absolutely nothing I could do. We’ve actually tried to joke about that confusion since, but it never really seems funny, even weeks later. That was the shittiest day of my farming life, and would rank up there with probably the shittiest day of my entire life. You want to know what makes the entire thing even shittier though? The toughness of pigs. I saw Ziggy and Stumpy burning. I heard them screaming. I was sure they were dead. They survived the fire though, despite horrific burns. They survived and I had to shoot them. It was the hardest thing I’ve ever done, and it took a good couple of weeks for the nightmares involving blood and burned flesh to go away. Thinking about it now still makes me tear up. Ziggy and Stumpy weren’t our only pig losses. I had one little grower girl who I’d seen taking shelter in a bath tub earlier in the afternoon. There was stubble burning a few metres from her, but she was safe in the tub without a heap of radiant heat. I’d lost track of her and one of her sisters, but remember seeing her in that tub and cheering. I called her a good girl and told her to stay put and that she’d be okay. Pigs being pigs, meaning they don’t understand me when I speak to them, and even if they could they’d probably choose to do exactly the opposite, that little pig decided to get out of the bath and walk through three burning runs to get back to her original water drum. I found her in there after the fire had gone through, and she was burned all over. She was so badly hurt that she couldn’t move. I had to drag her out, screaming the entire time, and shoot her. That little grower’s slightly bigger sister, the other pig I’d lost track of, ran through the fire to the back of the property. That meant she basically ran the entire breadth of the fire on our property. She wasn’t as badly burned as her sister, but the back half of her body was still horribly burned and she was unable to walk. I had to shot her too. It felt like a lifetime, but I doubt the entire episode took more than a couple of hours. I was up to nearly 2 the following morning putting out spot fires, but the worst of it couldn’t have been more than two hours. It didn’t end with the fire passing through though. Farmer John’s house burned for a long time, and was a real threat to our place. The last CFS crew at our place had to leave, and explained to us how embers could sneak in under the tiles on our roof. They suggested that I get up into the roof cavity every 10 or 15 minutes and make sure nothing was burning. They left me a fire extinguisher to put out anything I found in there. I alternated between sitting on the roof, watching the house of Farmer John, who is the best of men, burn, with a hose in my hand to put out the embers that were raining down on my place, and running down a ladder to stick my head into our roof cavity looking and sniffing for fire. I’ve never felt so powerless in my life. I have pictures of Farmer John’s house burning, but I’d never post them. His and Cynthia’s life was in that house, and they lost the lot. It would be inappropriate for me to expose that to anybody else, despite the tourists that have been coming past since the fire. I’ve developed a pretty good glare for those dicks. Putting out the spot fires took a surprising amount of time. The fence posts were especially hard to put out, as they burn from the ground up and it’s difficult to put that out with buckets of water, which is all I could really use (I did pee on a couple – desperate times call for desperate measures after all…). 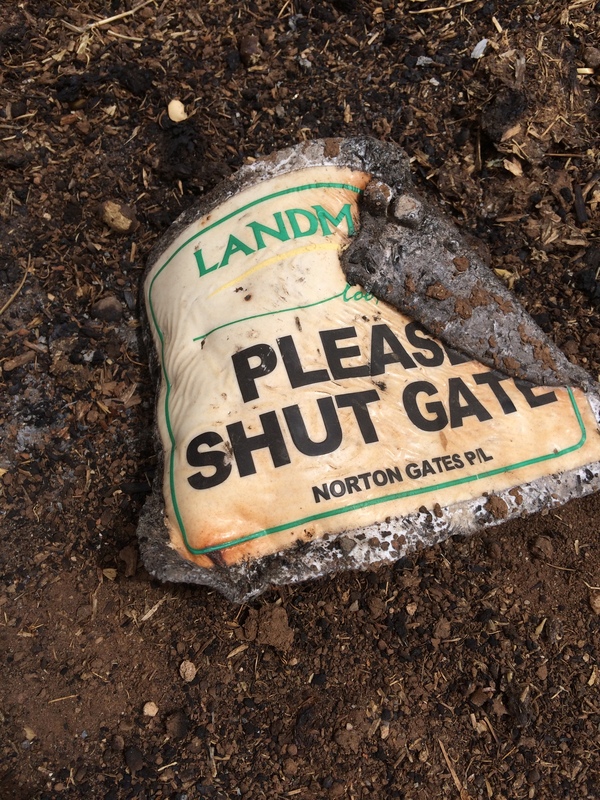 The other threat was Farmer John’s front garden, where plants were burning and streaming embers into my place on the wind that still hadn’t let up. I finally got that out near midnight, just as a final CFS crew called past and offered to help. They ran their hoses up and down the fence line and made sure I’d not missed anything. We spent a couple of days without power, but used our generator to run the big freezers to save the large amount of meat we have stored. Insurance would have covered that, but letting that much meat go to waste would fly in the face of everything we’re trying to do here. We had to rush around and look after the stock we’d saved too. 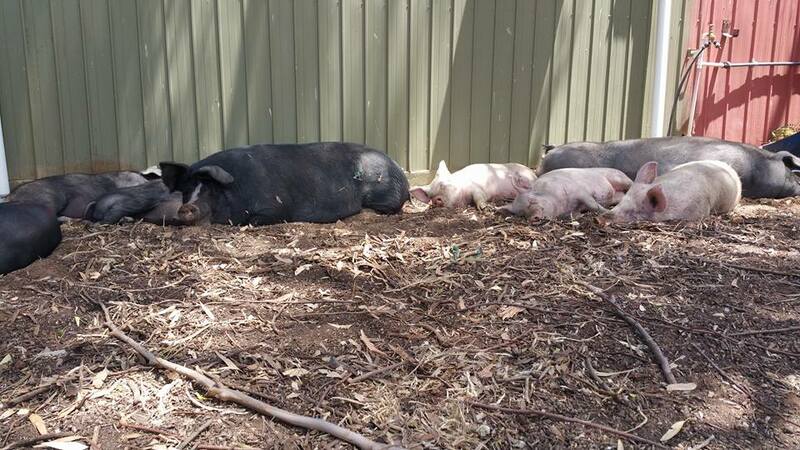 We put up temporary electric fencing for the pigs, who were quite happy to sleep against the big shed in the shade and ignore most of our efforts. The day before was horror and disaster, but today is being pampered and taking naps. As it turns out, Boris was almost untouched by the flames that maimed his two girlfriends. He had a bit of a limp, but wasn’t burned at all. He was super wary of the burned ground though, and it took me until late the following day before I could get him out of his burned run. He’d spent that night nestled against poor dead Ziggy, which was heartbreaking. I ended up having to lure him over his run with a bucket of grain, picking a relatively clear patch through the burned ground. He’d not step on the black ground at all. It wasn’t hot from the fire, but was warmer because of the sun. He’d not go near it either way, and it probably took me 15 minutes to get him out of there so I could drag Ziggy and Stumpy’s bodies out. It took me maybe 15 minutes to walk Boris 20 metres. I had to pick out an unburnt path for the big sook. As horrible as that all was, one of the surviving sows, Socks, showed some real interest in Boris after I moved him. I figured he could do with some company, and so let her in with him. Inside of maybe 60 seconds they were… healing their emotional wounds together. If you know what I mean. Boris and Socks finding comfort in each other’s arms (aka boning). That blood on his shoulder isn’t his – it came from Ziggy. The aftermath of the fire was devastating, with the loss of almost all of the infrastructure we’ve spent years building. This is a panoramic shot facing West – the fire here would’ve been coming straight at the camera. It could’ve been much worse though. 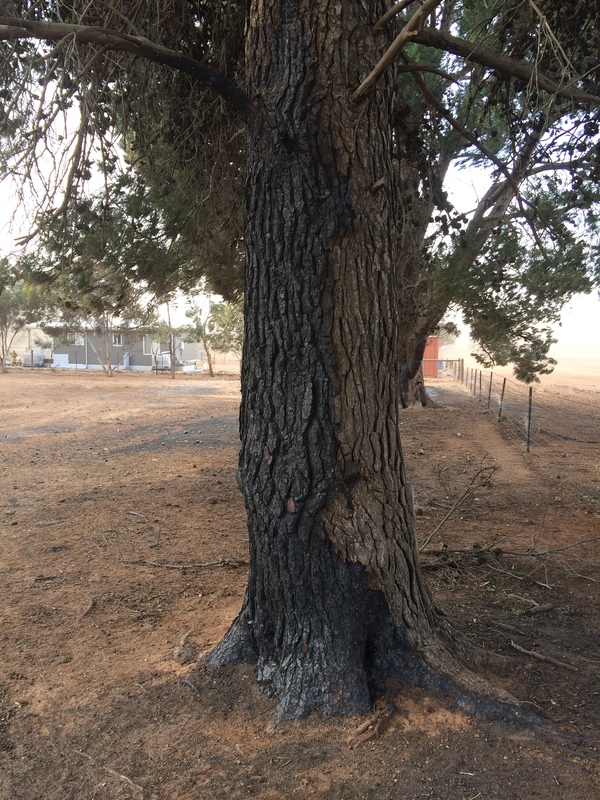 The big pine trees along the fence where the fire first hit ended up not burning. They were burning fiercely after the firestorm went through. Both dad and I saw them burning and were sure they were gone. For some reason the fire went out though, which I’m thankful for as they would’ve burned for a long, long time, and would’ve showered the place with embers. I think it was the wind that actually helped in that instance. They didn’t burn at all on the side hit by fire. Rather, it was the leeward side away from the wind that had caught and was burning merrily at the start, which was when dad and I had to start running around looking after stuff. Sometime shortly after that the dust, smoke, and wind must have snuffed the fire out. I can see charred wood a good 10 or 12 feet up those trees, right close to heaps of dry pine cones, but the trees are mostly undamaged. This is the tree I hid behind when the firestorm first came through. It’s scorched a good 10 to 12 feet up, but the fire was snuffed out by wind, smoke, and dust. Thankfully. 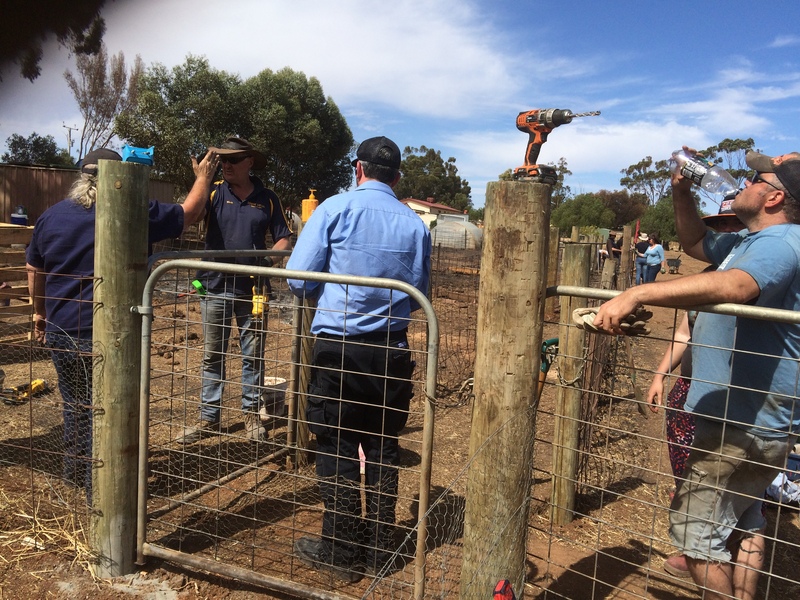 Only a week later we had some folks from our local Transition Movement come and help us rebuild runs and fences. 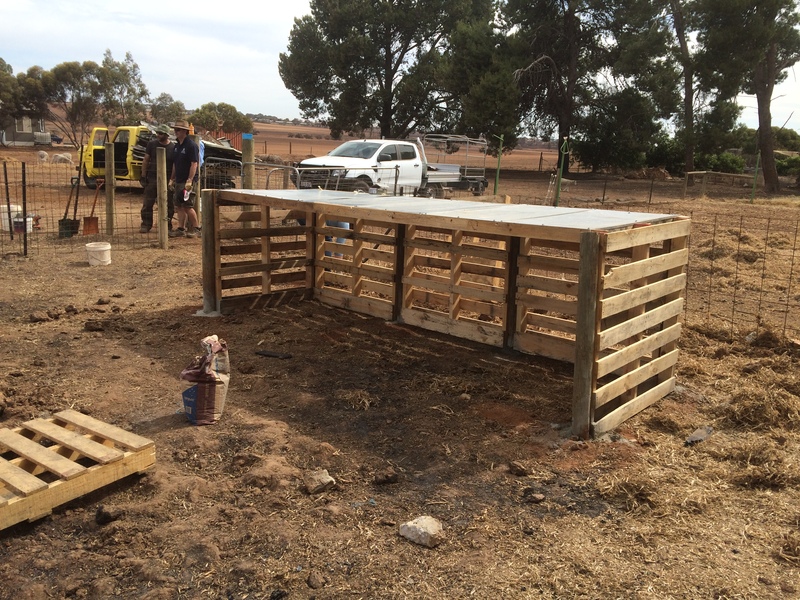 The handyman from the brewery where we get our spent grain had an idea on how to build some pig housing out of pallets, and he and a friend of his, who is now firmly a friend of ours too, got stuck in and built a couple of shelters that’ll do quite well. The entire thing was humbling but saved us so much work. I’d never have asked for that help, and would’ve taken a week to accomplish what the group did in a day. We had between 12 and 15 people helping out a week after the fires. This is dad high-fiving our good mate Peter. 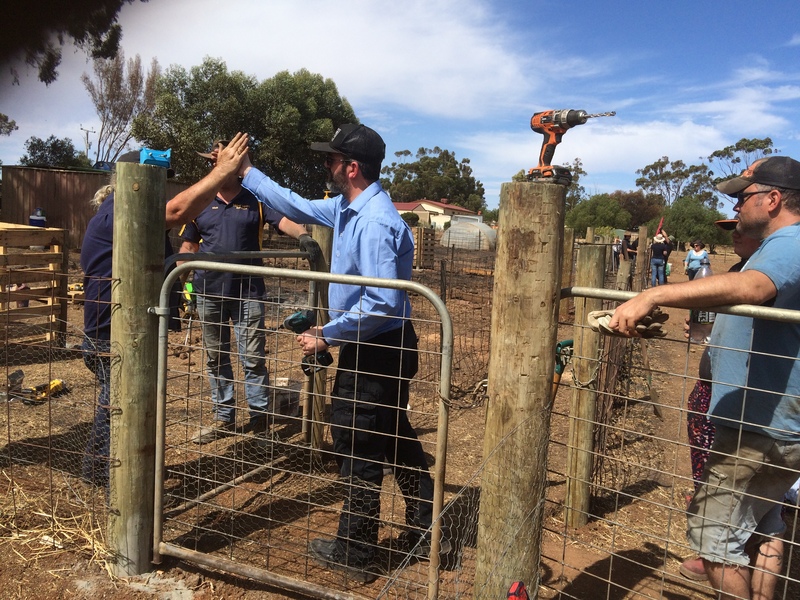 This is dad high-fiving our good mate Mark, who built our pig shelters. This is me high-fiving Miranda, who helped Mark build the pig shelters, and dad taking the opportunity for a sneaky hug. 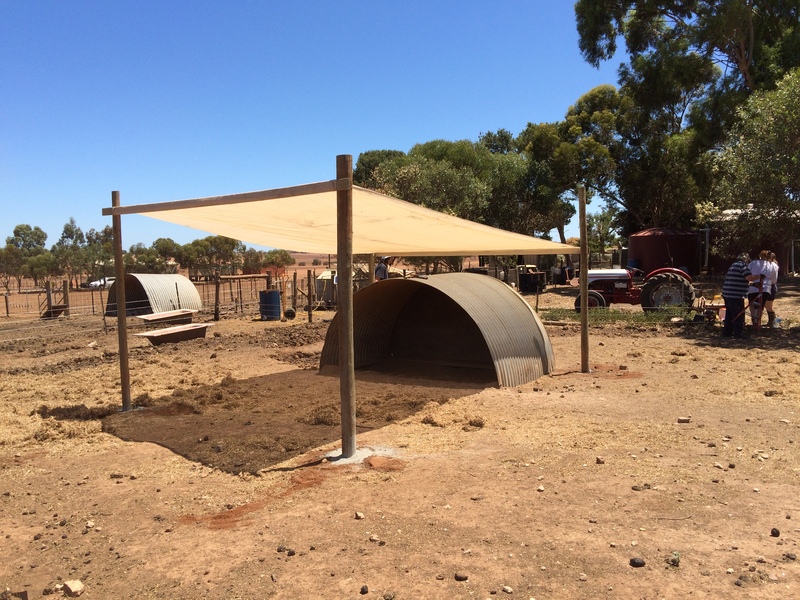 This is one of the pig shelters that Mark designed and Mark and Miranda put up. It’ll need some insulation come the cooler weather, but it works a treat now. It’s now a little over six weeks since the fires, and the property is fully recovered. In fact, in some respects we’re better than we were before, as we’ve made some modifications as we rebuilt. This is one of the improvements we’ve added since the fires. We’ve done the same over one of Mark’s pig shelters, and probably will over the other one too. I’ve thought long and hard about our decision to stay and fight. We never made a single bit of difference to that fire. I can say definitively that we never, not once, slowed the fire, changed its direction, or altered what it wanted to burn. It took what it wanted, and we were nothing to it. However, we saved our house, we saved most of the animals, and I was here to make sure that the burned pigs didn’t suffer. 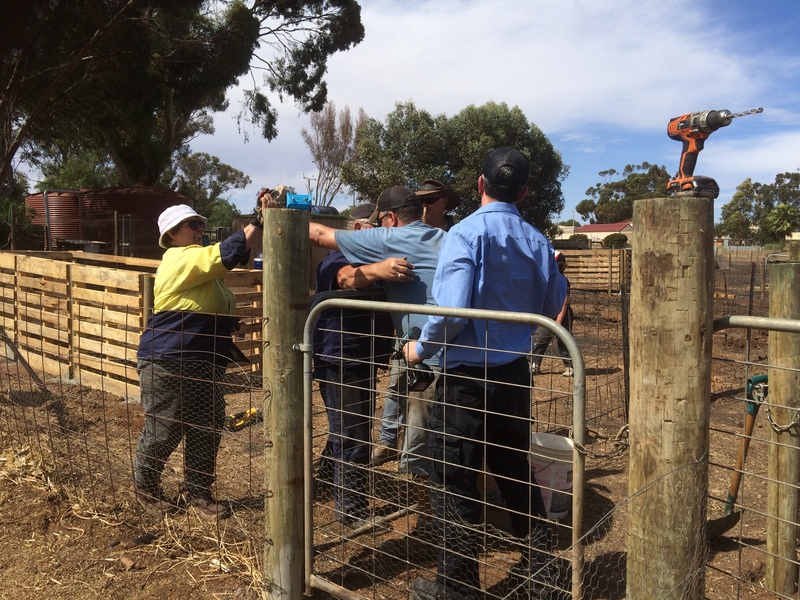 The CFS unit came back the following day to get their fire extinguisher. The lead of the crew told me that he hadn’t been at all confident that our house would still be standing when they came back, so dire was the danger we were in when they left. I am fully confident that we would have lost the lot had we not stayed, but next time we’ll be much better prepared. I have plans for petrol pumps, extra tanks, sprinklers on the roof, extra fire hoses etc. The next time this happens, and I expect with our changing climate that it will happen again, we’ll be ready and we won’t be powerless. That will result in a much happier blog post. I’m going to call that one “The Day Neil Beat a Bushfire and Then Had a Beer”. At no stage do I want to sound flippant about any of this, despite my tendency to use humour to deflect pain. Templers is small – we have maybe 15 houses. Three of those houses were lost, and dad and I helplessly watched two of them burn. 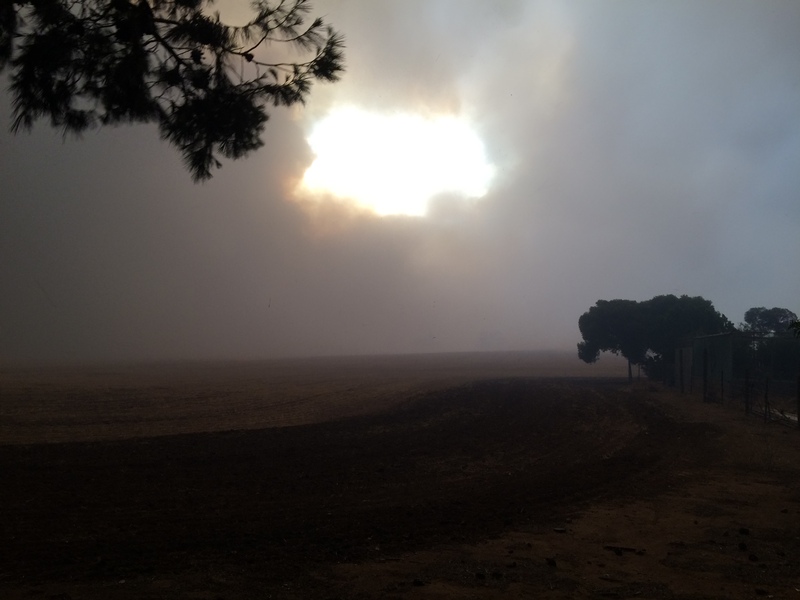 Between Templers and Roseworthy on the highway there are about eight houses, and four of them were lost. I read stats a few days later that spoke of 16,000 sheep, over 50,000 chickens, and 500 pigs lost. Two people died, and over 100 houses were lost in total. None of that is funny, and none of it should ever be forgotten. However, I’d like to firmly raise my middle finger to bushfires and make it clear that next time we’ll be fighting it far more effectively. It occurred to us in the aftermath of the fires that we may have a problem with dust over summer. 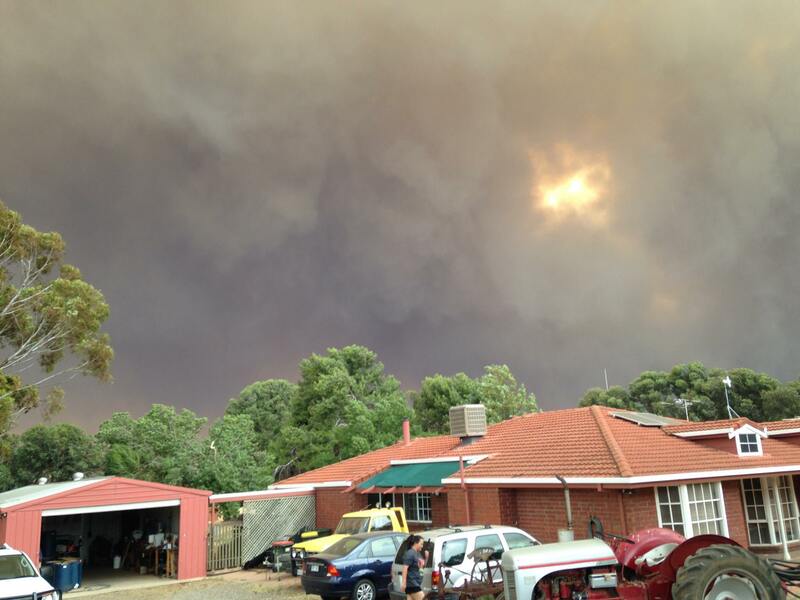 The fires hit right at the start of the hot weather, and summer here is merciless at the best of times. We expected it to be dry, and combined with the hot northerlies we get, it stood to reason that the dust may be problematic. We were right. 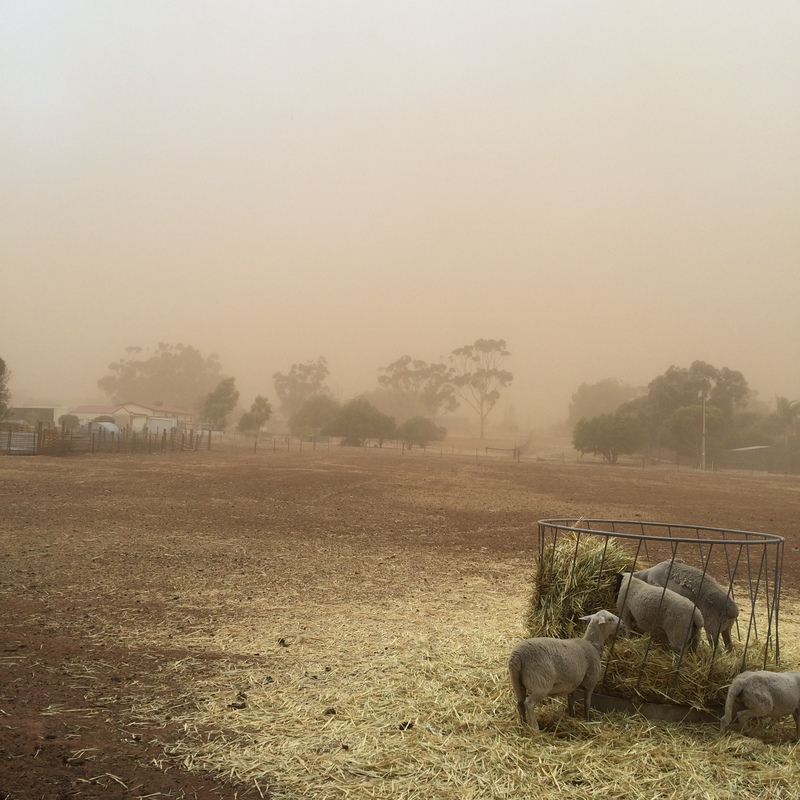 The back paddock, facing east, during one of the many, many dust storms. The sheep don’t seem to care so much. 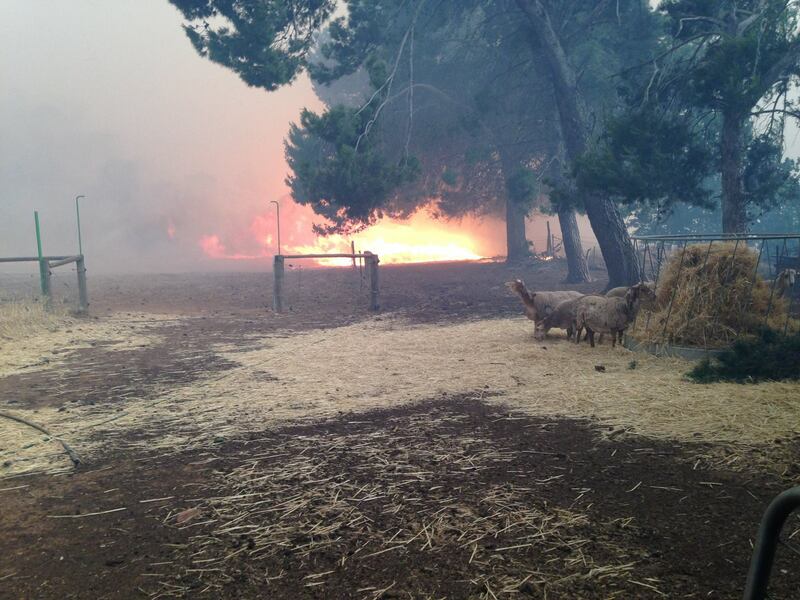 Then again, these same sheep were busy eating a bail of hay at the height of the fire. Back up towards the pig yards. We’ve rebuilt, so this must’ve been two or three weeks post-fire. 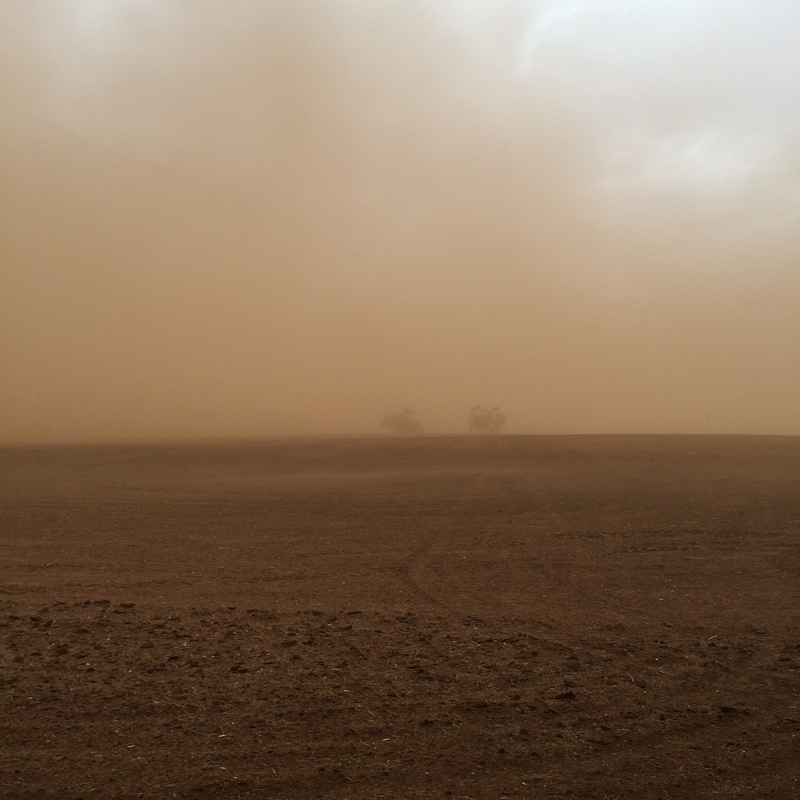 We had dust storms most days, though not always to the degree shown in those pictures. It got to the stage where we just quit trying to clean up outside. Our entertaining area was covered in drifts of red/brown for a good 10 weeks. The local farmers ploughed to combat the dust, which of course is a loss of their nutrient-rich topsoil. That sounds a little counter-intuitive, as you’d think that not disturbing the dirt would be the way to go. However, their aim was to turn over big clods of soil, giving the wind less loose stuff to blow around. It worked, though it took time. Luckily we had some early rain in the form of a couple of huge showers over a couple of weeks. 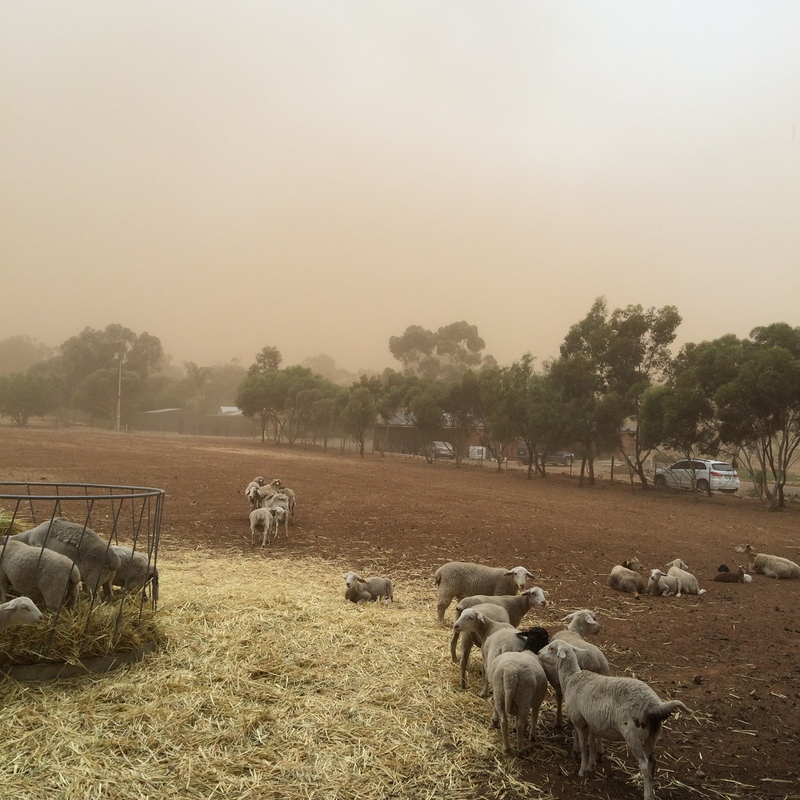 At first that kind of makes it worse – the rain/wind stirs up the dust and you end up with both a dust and a rain storm at the same time, the result of which is mud. That’s about as much fun as it sounds. However, the rain brought that welcome tinge of green, which is both pretty and keeps the soil where it should be. It’s now the start of April, and I’m pretty sure the dust is behind us. At least we’re confident enough that we’ve cleaned up the entertainment area. 🙂 It’s still weird driving through the fire grounds and seeing the difference between what was burned and what was spared. Seeing the burned out houses, or the cleared spots where you knew there used to be houses. Seeing the carbon deposits on the roads where you know there used to be a tree, but where there’s literally not even a stump left now, so ferocious was the fire. It’s getting better though, and that’s something. This entry was posted in November, 2015, Uncategorized. Bookmark the permalink. Travis shared the link to this so I came back for another read. I don’t even have words. I had them … but I don’t have them. I’ll miss Ziggy and Stumpy too. I like to think that they had a better life with you than they would have had anywhere else. We all loved those cute little snorty girls. I can’t get over the next day napping and love fest (emotional healing … with genitalia). We could learn a lot from them.